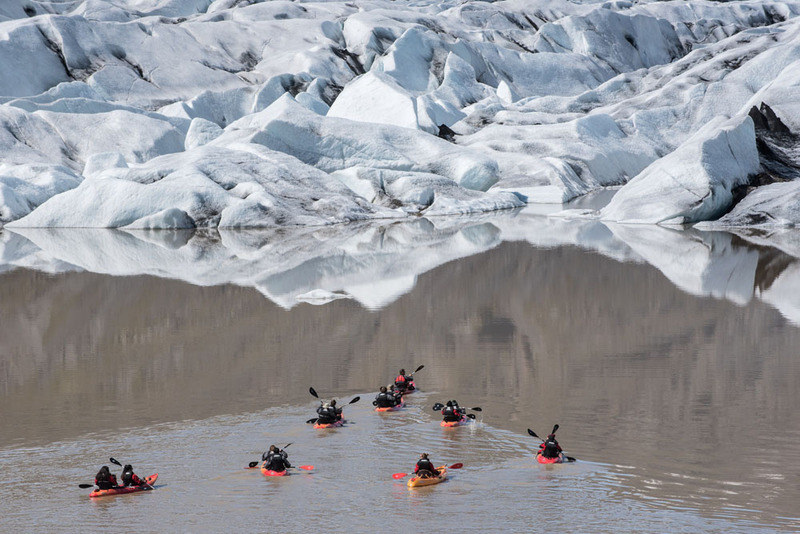 Glacier kayaking is the ultimate way to experience the magnificence of the world famous Vatnajökull National Park. 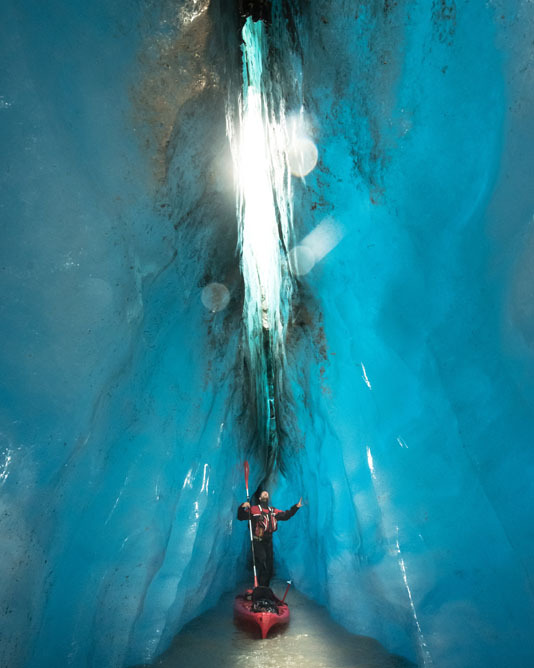 Join us on an unforgettable trip and enjoy unbeatable panoramic views of the surrounding mountains and glaciers and their reflection in the mirror like the water of the Heinaberg Lagoon. 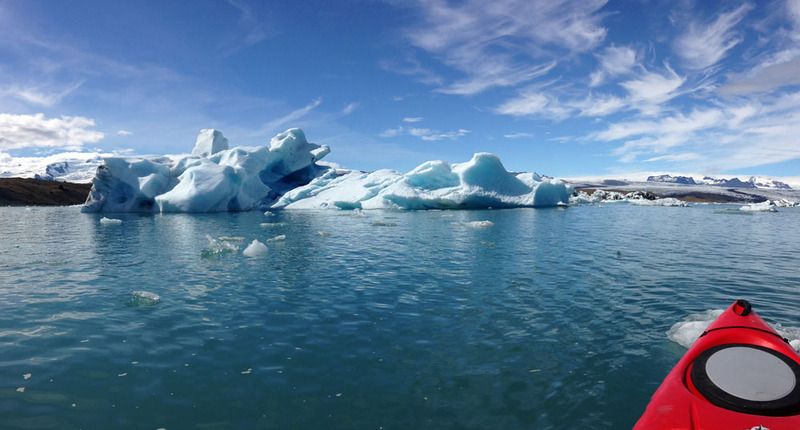 Included: Kayak, drysuit, safety vest, shoes, gloves, kayak paddle, transportation and a 15 min drive from our base camp to Heinabergslón glacier lagoon. The base camp is located at a place called Flatey, located 38 km west of Höfn. At Flatey the guides will outfit all participants with the appropriate kayak equipment and provide additional gear. Flatey is one of Iceland´s largest dairy farm and visitors have the opportunity to take a peek inside the farm. At Flatey you can buy basic refreshments and get access to free Wifi. We kindly ask you to be at the meeting point on time. We recommend arriving at least 15 min before the scheduled departure time. Late arrivals, unfortunately, will miss out on their reservation and it will result in the cancellation of your booking and a full forfeiture of your booking fee. 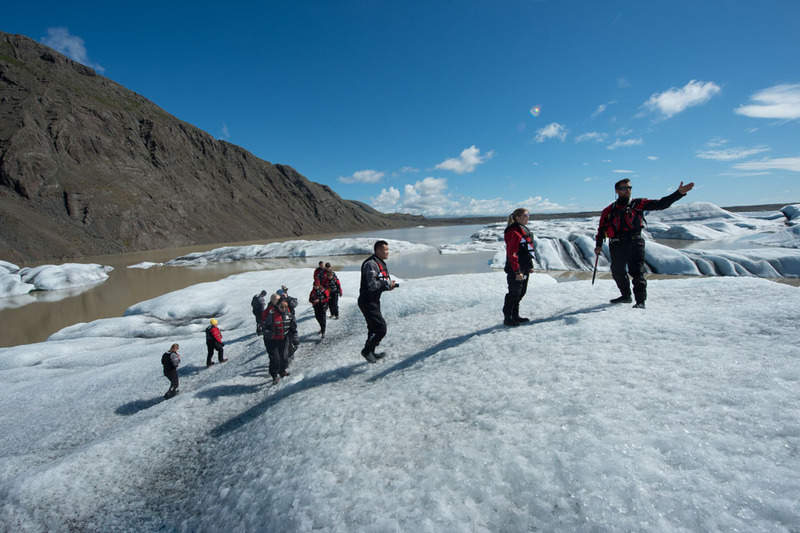 From the lagoon, you will have an excellent view over Vatnajokull and on the tour, we go for a short introductory glacier walk – safely equipped with the appropriate glacier gear. Heinabergslón is “out of the beaten path”, so there is no other traffic on the water. This is the tour for those who want to be environmentally friendly while exploring nature. 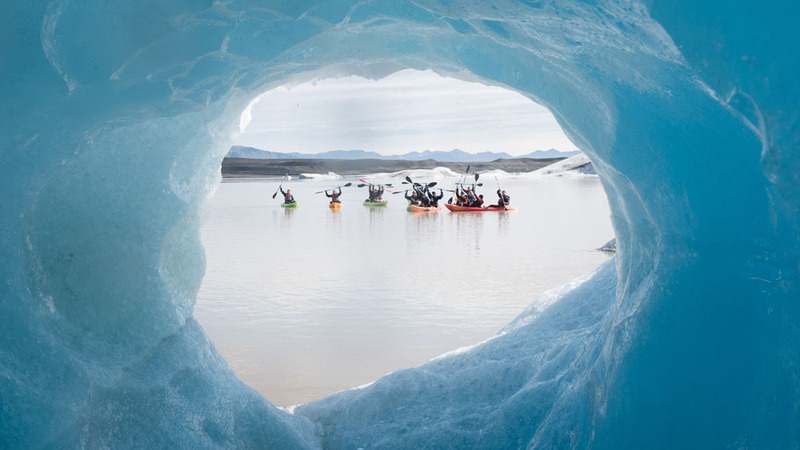 The trip is fully guided by guides with a vast knowledge of the area, its history, hidden spots – and of course kayaking. 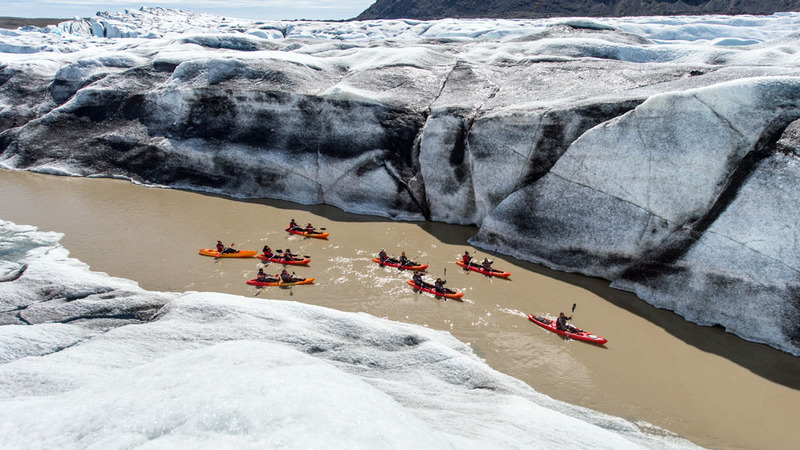 The Glacier Kayak Adventure suits people with no paddling experience to experienced paddlers. 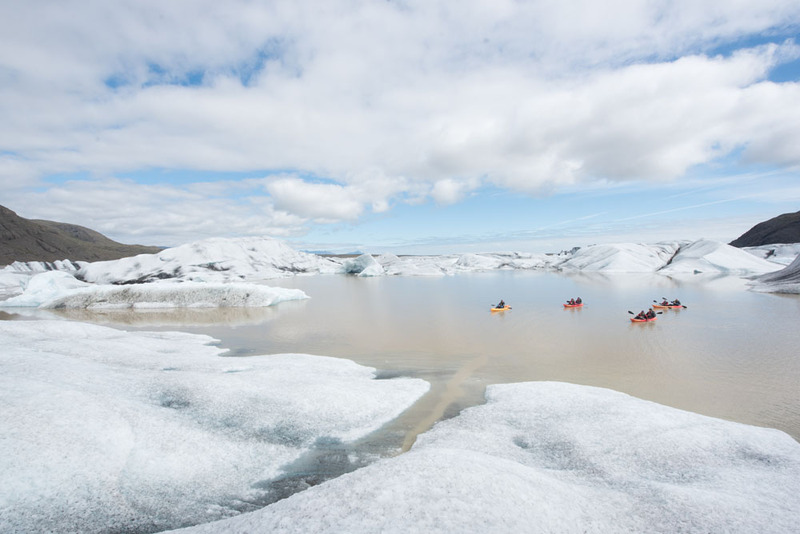 Our Kayaks are SIT-ON-TOP boats, very stable and should be suitable for first-time kayakers as well. We use SIT ON TOP kayaks. The boats are much wider than SIT IN kayaks and therefore much more stable. 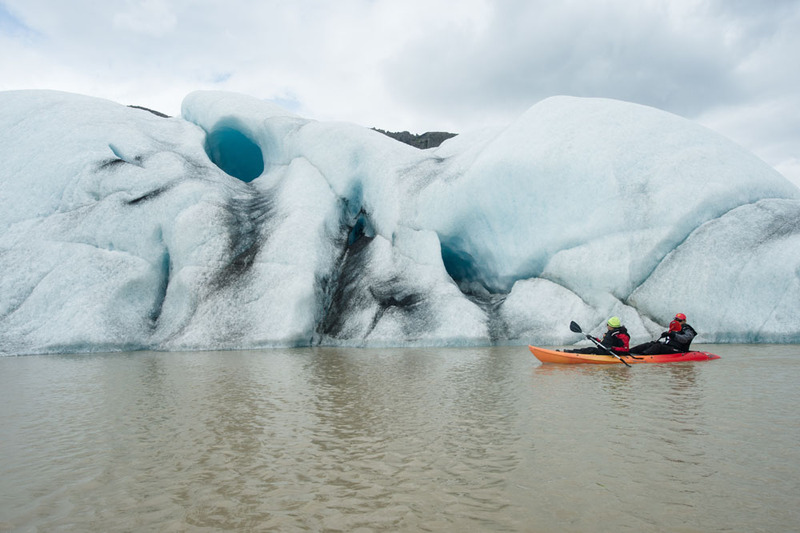 Beginners and those who have never gone kayaking before should not have a problem joining our tours. 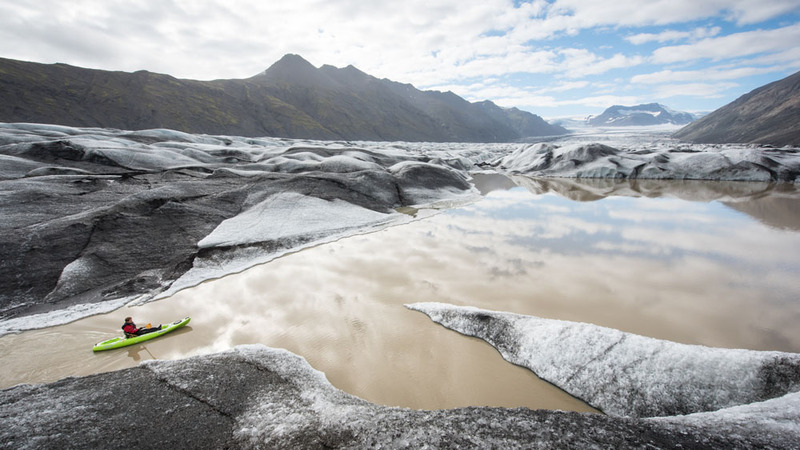 Grab your hiking boots and get ready, because you’re going to hike Sólheimajökull glacier in southern Iceland.